The beautiful historic coastal town of Zadar is very popular because of its stunning architecture, history, warm climate and beautiful crystal clear sea. Zadar is the fifth largest city in Croatia and the second largest in Dalmatia. With AFerry, you can book ferries to and from Zadar and Ancona in Italy. Below, you can find all the Zadar ferry timetables, journey times as well as our best prices. Jadrolinija ferries provide comfortable accommodation in cabins or in luxury suites. All of their ferries are equipped to the highest standards and on board you will always find a variety games, entertainment and shopping facilities, in addition to comfortable seating. There is also a rich choice of excellent food prepared on board by the Jadrolinija head chef. Zadar is a beautiful seaside city in the Dalmatia region. 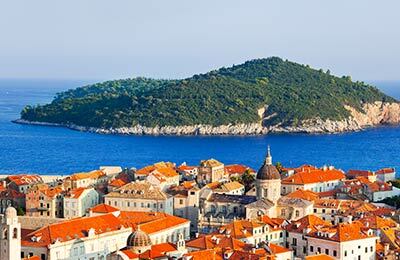 Important landmarks in Zadar are: the Roman Forum, St. Donatus' Church, St. Anastasia's Cathedral, St. Stosija's Church, St. Ilija's Church, St. Francis' Church, Five Wells Square, St. Mary's Church, the Citadel and The Land Gate. Zadar is becoming an increasingly popular tourist destination and is an ideal spot to visit if you are enjoying a Mediterranean holiday. Some say that Zadar is one of Croatia's more underrated destinations. You'll find peaceful traffic-free streets following the ancient Roman street plan with Roman ruins and several medieval churches to explore. Giving the whole town a historical feel, massive 16th-century fortifications shield the city on one side with high walls running along the harbour. The Old Town, where the port is located, has been rebuilt many times leaving a mesmerising mix of ancient and modern architecture. There are many museums to explore in Zadar that can fill you in on the ancient and sometimes turbulent history of the region and after that the tree-lined promenade along Obala Kralja Petra Kresimira IV is perfect for a lazy stroll and also the perfect place to stop for a coffee and watch the world go by. An activity that is popular throughout Croatia. Come the night, Zadar's large student population pours into the town's bars and cafés. You'll also find many restaurants in the town offering a wide variety of quality and prices. For beach lovers, there are a few small beaches east of the Old Town and more to the west at Borik where the water is crystal clear and perfect for a dip on a hot Summer day. Many natives of Zadar head by boat either to the offshore island of Ugljan or further afield to Dugi Otok for a short break from the city. 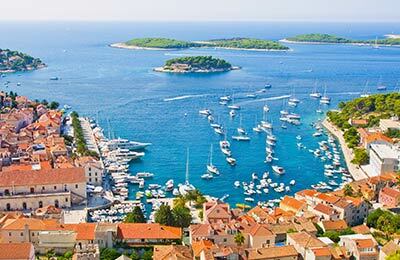 You can read more about Croatia in our Croatia guide. The ferry port is situated in the old part of the city and entering Zadar on a ferry gives you a magnificent view of the whole city, making your arrival in Zadar a unique experience. The port of Zadar is simple without many facilities, however, its central location means that there are nearby cafes and restaurants. Coming from route 8, follow Ante Starcevica then turn right in to Franje Tudmana and the next left into Put Murvice. From there just follow the signs.